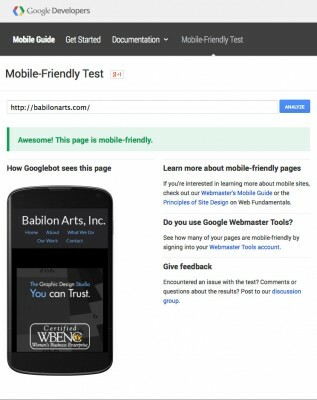 Is my Website Mobile Friendly - Babilon Arts, Inc.
On April 21, 2015 Google will begin rolling out a worldwide mobile-friendly algorithm update that will have a “significant impact” on mobile search results. In essence, if your website does not pass Google’s mobile friendly test they will send you fewer mobile search customers. 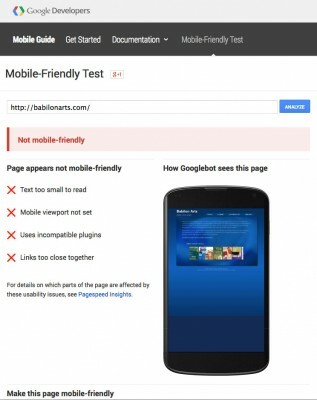 The mobile search engine results pages (SERPs) will be impacted by the mobile friendliness of a website. Google wants to make it easier for people using mobile devices to access websites that have been optimized for use on that device. There are more than 1.5 billion mobile Internet users worldwide and roughly 80 percent of Internet users own a smartphone. Google developers said that there would be a “significant impact” on search results. Site owners who have not taken steps to ensure that their sites are mobile-ready can expect to have their mobile rankings diminish greatly. For businesses receiving steady customers from Internet searches, this can result in a major drop in website visits and potential income. If your site has valuable information that performs well because customers find you helpful, they want you to continue to rank well. Mobile device website searches now account for 60% of online traffic. In order to keep up businesses we are all going to have to have a mobile-friendly website. Responsive Web design has provided the ability to host a single website that automatically adjusts to the size screen that it is displayed upon, such as small text, link spacing, horizontal scrolling, and other mobile usability issues. You can test your website to see how well it performs on mobile devices using Google’s webtool. Check out the “Mobile-Friendly Test” link. A positive test result means that your website will benefit from the mobile-friendly algorithm update. A negative test result means that your site will not benefit from the update, and that competitors’ sites that are mobile friendly could push your site down in the rankings. Thanks to one of my readers (Tiffany T.) there’s an even better Mobile Friendly test link: Click Here. Remember that a well-optimized mobile website will make it easy for customers to find the information they seek and complete their desired tasks on mobile devices.